LAST ONE IN’S A ROTTEN EGG!!! This is my boy Ekko. He is a wonderful addition to my family. When people meet my Ekko they are quite surprised at how calm and mellow he is. Not much excites him. I tried training him in scent detection, but smells (other then hotdogs) don’t interest him. I tested him to see if he’d be good at “Bite Work”, but bringing down bad guys didn’t get his attention. Being a service dog took too much energy. Guarding the property – well – that would be okay as long as he can bark while laying down with his eyes half closed. Lying on the couch with his big head in my lap, snoring, that seems to be his favoutite past-time. That and eating. 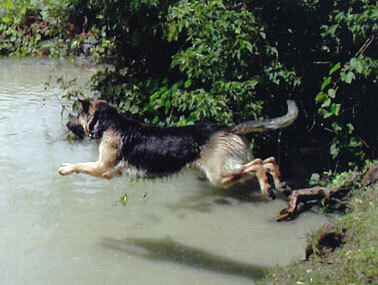 Should my big lazy bug happen to spy water - LOOK OUT – he is suddenly the greatest athlete in the dog world. He will spend hours swimming, fetching the toys thrown into the water, trying to catch the little fish swimming by, anything. This summer, after I had given up any hope of him being a service dog and having a job, he amazed me. A young man was floating by on a inner tube and playfully shouted out Help! Help! when he saw the big GSD playing in the water. Without ever having any training, Ekko swam out to the man and grabbed the inner tube (unfortunately puncturing it) and started pulling him back to me. The man tried to convince him to let go, but to no avail. Ekko was saving hing him. He got him to shore, let the tube go, licked the man’s face and dove back into the water. These dogs are amazing. They have such a strong desire to please and work for us, we just have to find the right position for them. My boy found his. Not the traditional role for a GSD, but the perfect one for him. "Ekko the Wonder German Shepherd"
Your Boy sounds "wonderful", he looks a Shepherd, I can see those big feet, big nose, and big ears laying back but he has some of the characteristics of a Lab. Ekko loves the water, I'm jealous I wished Mia, my GSD loved the water like my Lab, Ebony did. They are some Shepherd loves the water and you have one, lucky you. The fact that he "rescue", that his protectiveness kick in and that's what German Shepherd do, they Protect. Take care of your boy Ekko and he will take care of you. You can read our story right here just go to "puppy mia's story, and mia, my beautiful German Shepherd Dog" God Bless our Dogs! Is he part lab? I have a GSD/Husky so I was not for sure if yours was a mix. Sounds like a rescue dog for sure! My pup Acer loves the water as well. Ekko sounds wonderful, you check Acer out if you want.